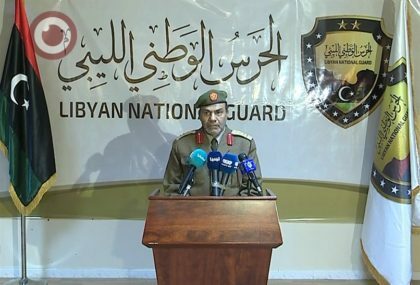 Chaos is festering in capital Tripoli as forces aligned with self-style Khalifa Ghwell announced Thursday the creation of the Libyan National Guard (LNG) to protect institutions and foreign missions. The announcement came from Brig. Mahmoud Al-Zigal who indicated that the LNG is not linked to any political party and would operate away from regional, tribal and political disputes, reports say. The men from Misrata, Ghwell’s hometown, arrived in Tripoli on Wednesday in a convoy of a dozen vehicles triggering heavy clashes with an armed group loyal to the GNA in the southern districts of Salaheddin and Abu Salim, Reuters reports. Most of the brigades under the Libyan National Guard took part in Sirte battle against IS, The Libya Observer reports. “The LNG will stand against all criminal and terrorist acts and it will provide support to all state institutions and protect them from coup attempts and terrorist acts,” Al-Zigal said. “We will provide all support to build a Libyan army based on technical standards, an army that is not involved in the political disputes,” he added. According to Al Zigal, the LNG will also take on illegal migration and spread of arms and provide protection to foreign missions. Al-Zigal denied that the LNG is under Ghwell, the former head of the Salvation government. Ghwell still controls some factions in capital Tripoli. The former Tripoli strong man in January announced the overthrow of the UN-backed Government of National Accord after he seized three ministries including the defense department. The LNG was first announced in 2015 by the General National Congress, the Salvation Government’s affiliated parliament which does not recognize the GNA. The GNA installed in the capital in March 2016 has been unable to assert its power. Despite driving out IS militants from Sirte, the UN-backed unity government has become unpopular. Few hours before his replacement by Palestinian Former Premier Salam Fayyad was leaked, Head of the UN Special Mission in Libya Martin Kobler announced that the GNA and the Presidential Council would undergo changes to include the other GNA major rival Field Marshal Khalifa Haftar.